The best love stories are often those of love without boundaries. Think of Romeo and Juliet, Rhett Butler and Scarlet O’Hara, Prince William and Duchess Katherine or even Mother Teresa’s love for the poor. These love stories tell us of how love can reconcile differences and surpass all hardships. Joseph Rana Biswas and Nancy de-Sagun Biswas have celebrated their love into marriage despite cultural differences. Joseph being Bangladeshi and Nancy being a Filipina, their love story is a real life testament to love’s ability to span across cultures. Nancy tells Kasal.com how they celebrated both love and cultural diversity in their very special wedding day. Serendipity, fate, destiny or coincidence? Joseph came to the Philippines from Bangladesh to study Theology. They became classmates in a class called “Cross-Cultural Discipleship” in a Bible College here in the Philippines. Nancy has always wanted to be a missionary after graduation. Nervous and uncertain about God’s plan for her, she was constantly praying for a country she could go to. A requirement for the class is to interview a foreigner who had either a Muslim, Hindu or Buddhist background. Nancy and Joseph’s paths crossed when she sought his help for the project. Despite Joseph saying that he will never marry a Filipina, or Nancy being aloof to suitors, their relationship took a turn when they became close friends. “I started loving him because of the true substance of friendship he shared with me… We had cultural misunderstanding at first but God helped us settle it.” Nancy said. Lo and behold, they are now married. 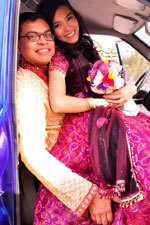 Coming from Bangladesh and the Philippines, the couple certainly had to talk about how they would celebrate their wedding together. The two different cultures had to come as one on their wedding day. Nancy agreed that it was a challenge to infuse two cultures together. Proving that a multicultural wedding is not an impossible feat, after a year of wedding preparations, the dream wedding finally came true. Guests wore Asian-inspired attires to be in theme with the wedding’s multicultural feel. Bridesmaids and flower girls on the other hand wore Bangladeshi-inspired dresses even if they were Americans and Filipinos. Americans, Filipinos, Korean, Bangladeshis and Chinese friends also came which made the wedding more multicultural. 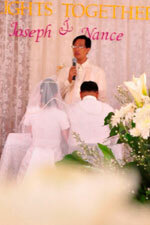 The wedding ceremony was very Filipino with Joseph and his father wearing a Barong Tagalog. During the reception, Kundiman songs were played which made the wedding even more unique and enjoyable to the guests. The food were also deliciously Filipino. The wedding was also very Bangladeshi with Joseph’s father giving them a word of exhortation in Bangla.The wedding cake decorations were also Bangladeshi-inspired as well. To top it all of, the bride and groom changed into Bangladeshi-inspired outfits that completed the whole wedding theme. The result was an absolute colorful wedding with designs, traditions and people splashing together to paint one amazing picture of a wedding. Nancy happily remarked that she got the wedding she has always dreamt of. Their difference in culture made their wedding more unique and memorable not only to them but also to their family and friends. More than that, what we found most inspiring from the Biswas couple was their deep understanding of each other and their marriage. Above all else was their vow to commit themselves to each other as a couple in the eyes of God. True enough, their prayers were answered. With Joseph and Nancy’s love story, we’re sure that there is no such thing as coincidence. Just like all the other great love stories out there, it’s got to be God’s chosen destiny.